Before mitosis, the cell creates an identical set of its own genetic information – this is called DNA replication. The genetic information is in the DNA of the chromosomes. 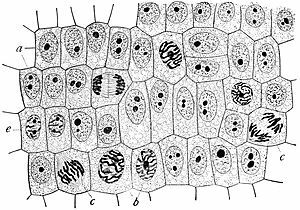 At the beginning of mitosis the chromosomes wind up into visible objects that can be seen with a light microscope. 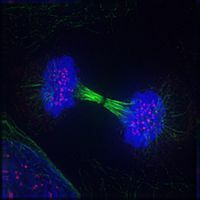 The chromosomes are now two chromatids joined at the centromere. Since the two chromatids are identical to each other, they are called sister chromatids. 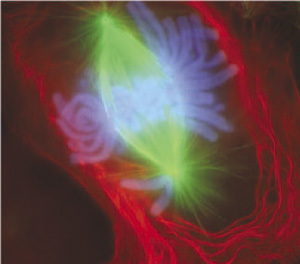 During metaphase, the sister chromatids are aligned by the pushing and pulling of the attached kinetochore microtubules, similar to a game of "tug of war". Both sister chromatids stay attached to each other at the centromere. The chromosomes line up on the cell's equator, or center line, and are prepared for division. 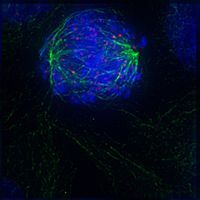 Cell shape changes through mitosis for a typical animal cell cultured on a flat surface. 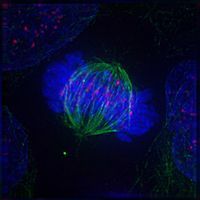 The cell undergoes mitotic cell rounding during spindle assembly and then divides via cytokinesis. 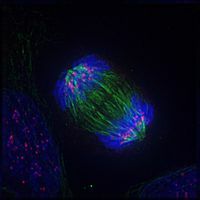 The actomyosin cortex is depicted in red, DNA/chromosomes purple, microtubules green, and membrane and retraction fibers in black. Rounding also occurs in live tissue, as described in the text. Mitosis Facts for Kids. Kiddle Encyclopedia.